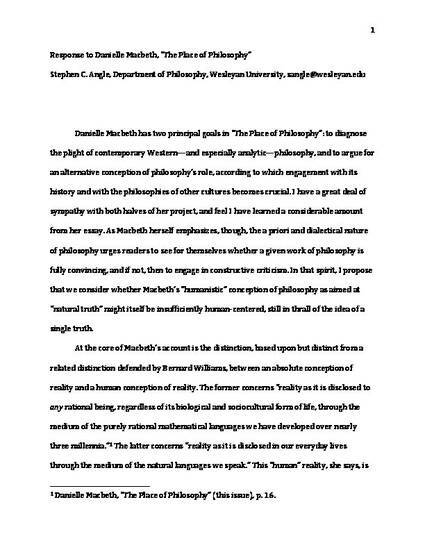 This short piece is a response to Danielle Macbeth's essay “The Place of Philosophy.” In her essay, Macbeth has two principal goals: to diagnose the plight of contemporary Western—and especially analytic—philosophy, and to argue for an alternative conception of philosophy’s role, according to which engagement with its history and with the philosophies of other cultures becomes crucial. I have a great deal of sympathy with both halves of her project, and feel I have learned a considerable amount from her essay. As Macbeth herself emphasizes, though, the a priori and dialectical nature of philosophy urges readers to see for themselves whether a given work of philosophy is fully convincing, and if not, then to engage in constructive criticism. In that spirit, I propose that we consider whether Macbeth’s “humanistic” conception of philosophy as aimed at “natural truth” might itself be insufficiently human-centered, still in thrall of the idea of a single truth.